Flying south for the winter? Consider Kiwiland if you want a collection of breathtaking photo memories. Instagram has just announced New Zealand’s top 10 spots, based on the number of images geotagged to specific locations. This year’s list sees some old favourites as well as some new entries including a new location sitting at number one. Check them out in the list below. Described by Rudyard Kipling as the ‘eighth wonder of the world’, Milford Sound was carved by glaciers during the ice ages. It’s breathtaking to see the fiord’s cliffs rise vertically from the dark waters, the mountain peaks scrape the sky and waterfalls cascade from as high as 1,000 metres. A boat cruise is an excellent way to experience Milford Sound. If you’re game for some adventure, there are opportunities to kayak, dive or flightsee. The the underwater observatory at Harrison Cove brings you up close with the area’s marine life. The Hobbiton Movie Set Tour is probably a must for Lord of the Rings fans, but even if you’re not one, this is an amazing part of the country to visit. You will fall in love with the Alexander family sheep farm, just as acclaimed director Sir Peter Jackson did, as you journey through the unequivocal beauty of the land, with the mighty Kaimai Ranges towering in the distance. About three hours’ drive southwest of Christchurch in the Mackenzie Basin, the Lake Tekapo township faces north across the remarkable turquoise coloured lake to the mountainous drama of the Southern Alps. Lake Tekapo gets its intense milky-turquoise colour from the fine rock-flour (ground by glaciers), which is suspended in the water. It’s well worth a visit the beach town that occupies a peninsula at the southern end of Tauranga Harbour. The peninsula is really a huge sandbar, with a sheltered bay on the inner harbour side and a magnificent surf beach on the ocean side. At the very tip of the peninsula is a distinctive peak – Mauao – which rises to 230 metres above sea level. There’s a choice of tracks leading to the summit, some more challenging than others. Huge views of the harbour, beach and Pacific Ocean make the effort totally worthwhile. Aoraki Mount Cook National Park is home of the highest mountains and the longest glaciers in New Zealand. It is alpine in the purest sense – with skyscraping peaks, glaciers and permanent snow fields, all set under a star-studded sky. According to Ngai Tahu legend, Aoraki and his three brothers were the sons of Rakinui, the Sky Father. While on a sea voyage, their canoe overturned on a reef. When the brothers climbed on top of their canoe, the freezing south wind turned them to stone. The canoe became the South Island (Te Waka o Aoraki); Aoraki and his brothers became the peaks of the Southern Alps. Just 50 minutes’ drive from Queenstown over the magnificent Crown Range, Wanaka perfectly complements neighbouring Queenstown. It is beautiful all year round, set against the alpine backdrop of Mount Aspiring National Park. Downtown Wanaka is home to a vibrant mix of restaurants, cafes, shops and plenty of ambient areas to relax and enjoy the amazing scenery. If you’re good to cast, the fishing is superb. There’s a multitude of adventure activities on offer and anywhere you walk you’ll find breathtaking scenery and wide open spaces. Tongariro National Park is New Zealand’s oldest national park and a dual World Heritage Site. The Tongariro National Park is rich in both cultural identity and dramatic, awe-inspiring natural scenery. Unique landforms, including the volcanic peaks of Ngauruhoe, Tongariro and Ruapehu ensure the Tongariro Alpine Crossing is considered a world-renowned trek. A vibrant beachside destination with a city rhythm, Takapuna offers a relaxed beach atmosphere, designer shopping, a thriving hospitality scene with a huge variety of cafés,restaurants and bars with simply stunning views out across the Hauraki Gulf to the iconic Rangitoto Island. Walk the historic lava trail along the beach foreshore, paddle board or kayak at the beach or choose to relax by Lake Pupuke, Auckland’s only fresh water lake. Stroll the Sunday markets, take in a live show, enjoy the hospitality. Takapuna has it all. New Zealand’s third largest lake occupies a single, glacier-carved trench and is bordered on all sides by tall mountains, the highest of which is Mount Earnslaw (2,819 metres). Settlements around the lake shore include Queenstown and the villages of Kingston, Glenorchy and Kinloch. Because of its unusual lightningbolt shape, Lake Wakatipu has a ‘tide’ (more correctly, an unusually large seiche or “standing wave”), which causes the water to rise and fall about 10 centimetres every 25 minutes or so. Maori legend links this phenomenon to the heartbeat of a huge monster named Matau, who is said to be slumbering at the bottom of the lake. 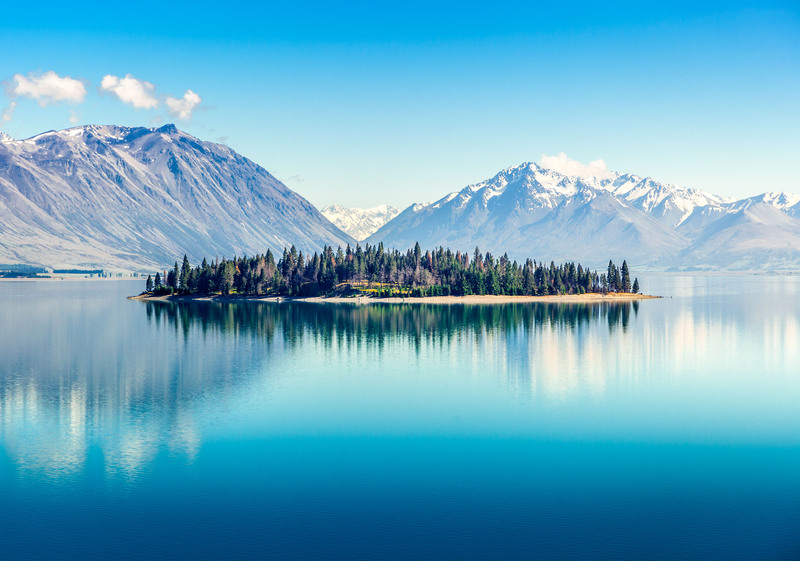 Lake Pukaki proudly shows off New Zealand’s tallest peak, Mount Cook, from the many lookout points around its shores. The water colour of the lake is a bright turquoise due to glacial flour, made from extremely fine rock particles from the surrounding glaciers. When the sun hits the surface of the lake, it reflects off the particles transforming it to a brilliant blue. The combination of the magnificent lake, surrounding peaks and wide open skies is a dream for photographers.